A top-notch thriller about Mossad agents trying to capture a war criminal in order to bring him to justice boasts an excellent cast including Helen Mirren, Sam Worthington and Tom Wilkinson and spans the decades from the Cold War to the contemporary, and locations from Berlin to Tel Aviv. Intelligently directed by John Madden, The Debt makes a fascinating study of evil and deserves serious attention. Just when many may have thought that Cold War thrillers had gone out of fashion, along comes one to reinvigorate the genre. The action bounces back and forth between Berlin in the 1960s and Tel Aviv in the late '90s. 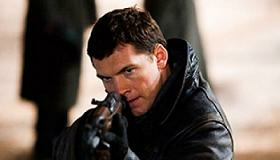 The young Mossad agents David (Sam Worthington), Rachel (Jessica Chastain) and Josef (Marton Csokas) have been charged with bringing to justice a Nazi war criminal (Jesper Christensen), dubbed the "Surgeon of Birkenau." Much of the early part of the story takes place in Berlin in 1965 where Rachel, David and Josef are closeted in secrecy, awaiting the appropriate moment to pounce. Rachel and David pretend to be a married couple with infertility problems to get closer to the doctor, who now specializes in gynecology. Ordered to kidnap him and move their operation from East to West Berlin, their task is one that requires incredible reserves of ingenuity and careful timing. Three decades later, the three agents are considered heroes. Rachel (now played by Helen Mirren) has married Stefan (Tom Wilkinson), while David (Ciarán Hinds) has reappeared on the scene after having departed for several years on his travels. But not all is what it seems on the surface. Rachel's daughter (Romi Aboulafia) publishes a book about the team's Cold War exploits, thus reopening the events and highlighting a convenient omission of facts. Now is the time to settle old scores. Madden sustains the taut atmosphere, changing considerably the organization of the story as it appeared in Israeli film Ha-Hov, upon which The Debt is based. Thomas Newman's expansive score subtly edges along the tension. Word of mouth is likely to be extremely positive and won't short-change audience expectations. Given careful nurturing and time to build The Debt has the ability to clock up some impressive returns. Rating: R for some violence and language.